The rugged landscape is a result of several periods of volcanism dating as far back as 440,000 years ago. The Coso Mountain range was an active chain of small volcanoes. 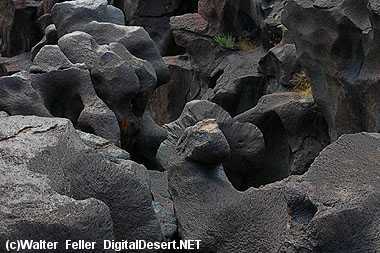 They erupted many times, inundating this area with slow-moving flows of dark lava called basalt. 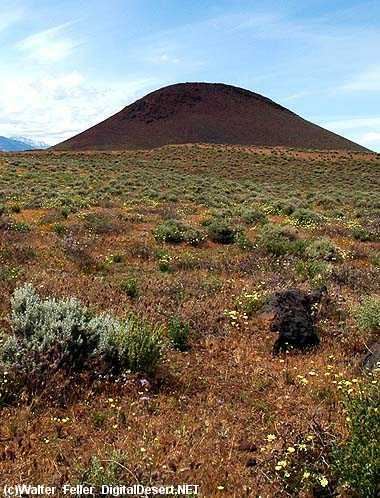 The red cinder cone visible to the north is the result of the violent ejection of trapped gases and molten material into the air from vent in the earth's crust. Cooling quickly when exposed to the air, the molten material formed a porous rock known as scoria, which built up around the original vent forming a cone-shaped hill. The Falls During the last ice age, the Sierra Nevada mountains to the west were covered with ice. Several times during this period large lakes formed in many of the basins between here and Death Valley. In these times the Owens River flowed south out of Owens Lake into the Indian Wells Valley. Volcanic eruptions from the Coso Range changed the river's course at least three times. Fossil Falls were formed when the Owens River was dammed by an eruption and ran over the basalt flows, sculpting and polishing the black rock into this amazing geologic feature. Some 10,000 to 20,000 years ago, the first human beings camped along the ancient rivers and lakes of the Mojave Desert. These prehistoric people harvested lakeshore resources and hunted large animals. By 6000 B.C., extreme aridity caused the last of these ancient rivers and lakes (including the Owens River) to disappear. The grasslands, marshes, and large mammals that had once flanked these lakes vanished. Prehistoric human populations may have partially abandoned low-lying desert areas in search of food and water in upland mountains areas. Around 4000 BC, climatic conditions again shifted from the extreme aridity of the preceding period to the relatively moderate conditions that exist today. 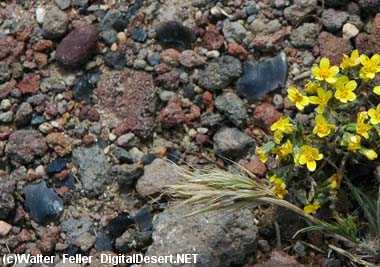 A cultural pattern was established that emphasized the use of a wide variety of desert plant foods that included both small and large mammals, reptiles, insects and waterfowl as well. With only slight adjustments such as the additions of pottery and the bow and arrow, this way of life was still being practiced by the Little Lake Shoshone Indians at the time of the first European explorations of the Mojave Desert. 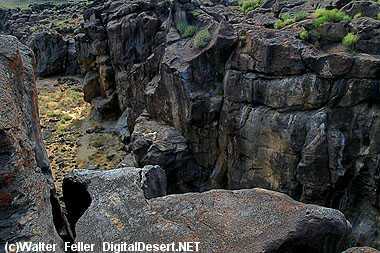 Many of the archaeological sites at Fossil Falls are dated between 4000 BC and European contact in the 19th century. Most of the archaeological materials found in the Fossil Falls vicinity, reflect this unique cultural adaptation to the desert environment. The rock-ring features directly adjacent to Fossil Falls supported conical brush or tule structure that served as shelter for only few weeks or month of the year. As mentioned previously, the need for mobility as various plant foods ripened at different localities made permanent structures unnecessary. A number of rocks and boulders possess smooth basins on their upper surface. These rocks are called metates and were used for plant processing: hard desert seeds were placed on the metate surface and ground with a handheld cobble called a miano. Over time, this grinding motion produced the characteristic smooth concave surface of the metate. 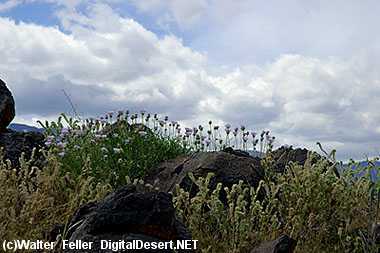 The surrounding desert also contained the raw materials for a simple hunter-gatherer technology. The black scar seen on the dome-shaped hill to the east is a mile-long seam of volcanic glass, obsidian. Obsidian was used almost exclusively in the manufacture of stone tools such as projectile points, knives, and scrapers. The large scatters of obsidian waste flakes seen in the Fossil Falls vicinity are the byproducts of stone tool manufacture.